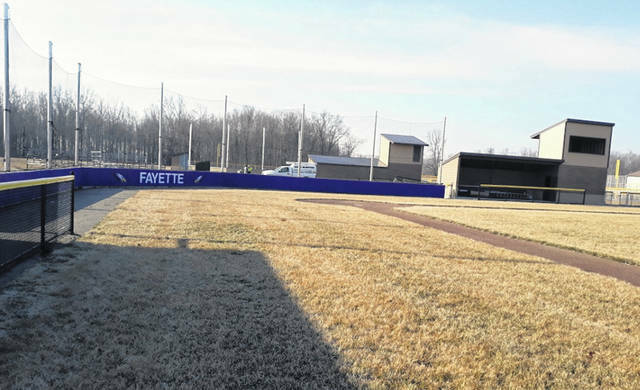 Fayette Local Schools has a new field for their varsity baseball team as part of its new spring sports complex. Fayette added an all-weather eight lane track to support the Eagles’ track and field team. Fayette’s new softball field as part of the spring sports complex. You can almost hear the whispers in the early morning March breeze. For years and decades, Fayette High School played their spring sports in the town park that used to be in the valley below the school complex. The old school has been replaced by a new and improved model just south of town. The same can now be said of a major spring sports complex, located on the campus grounds, that second-year athletic director Dylan Henricks hopes will help bring an enthusiastic aura to baseball, softball and track in the community. “When I took the job in July of 2017, the plans were already in place,” explains Henricks. “We were looking at expanding the opportunities here at Fayette. “I guess if you would’ve looked out there before March or April that year, all that was, was a hay field out there. So when I took the job they were moving dirt and the plans were in place of the layouts and where we wanted fields and our track. Henricks was a three-sport athlete at Evergreen, and after being a two-time All-NWOAL pick as a shortstop, took his talents to Huntington College in Indiana, where he was a four-year starting infielder. It’s no secret that baseball was his biggest love athletically and the Eagles’ new complex will maintain that affection. The scenic facility is complete with separate press boxes for baseball and softball. There are also three youth fields, each with different fence dimensions so that three different age group games can be played at the same time. 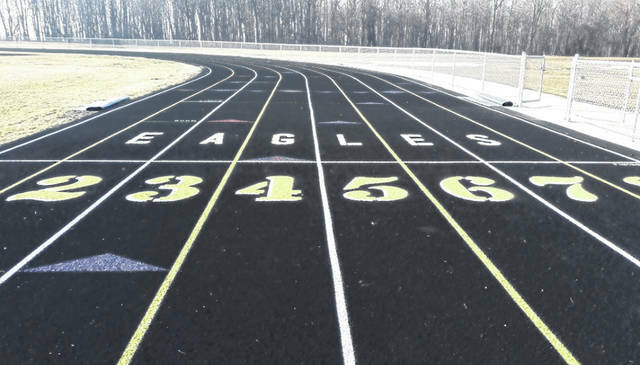 The Eagles also have an all-weather eight lane track, granting the chance to hold the Buckeye Border Conference meet, and future invitationals that will attract teams from northwest Ohio to the new complex. “Our ultimate goal now is to get the kids involved more and increase our numbers in our spring sports,” said Henricks. “Because of our current numbers, it’s important too for our dual sport athletes as well. Those athletes that are capable of playing either baseball or softball AND doing track will have it easier to go from one practice to another having facilities right next to each other. They can go maybe 100 yards or less, from softball or baseball to on the track. It has been a number of years since the Eagles have had any kind of success in spring sports, but Henricks totally believes that the new facility will change that. “The community has been very supportive, without them we wouldn’t be able to do what we have done and are continuing to do here,” he said. “What I’m really excited about is the three youth fields, because ultimately that’s where it all starts. You have to have a solid foundation with your youth programs in order to achieve the things you want to achieve at any level. It’s being built…time for the whispers from the hay field to turn to cheers everywhere from the vantage point on the hill outside left field at the baseball field, to those surrounding the fence line of the track.